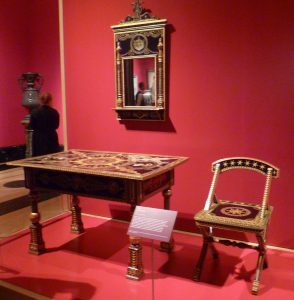 The new exhibition Russia: Royalty & Romanovs at the Queen’s Gallery, has all the splendour one would expect with Fabergé eggs and other objets d’art but the initial contact between the two countries was in the late 17th century, and low key. The story really begins with Tsar Peter the Great (1672-1725), who came to the throne after a turbulent and perilous childhood. He realised that, if he were to keep the throne, Russia must modernise, and, for that, he needed Dutch and British naval know how. He travelled first to the Netherlands, and then, at King William III’s invitation, he came to London to learn about ship-building and civil engineering, amongst other things. His stay lasted from January to April 1698, and it was more of a fast-track apprenticeship than a royal visit. Nevertheless, he met King William III informally a number of times. Russia and Britain’s relationship was diplomatically established as friendly but it didn’t really become a personal relationship between the two royal dynasties until the early 19th century with Tsar Alexander I (1777-1825). Russia had become a British ally during the Napoleonic wars, and the Tsar visited Britain in 1814 for the (premature) Peace Celebrations to mark Napoleon’s defeat. The story of Napoleon’s disastrous invasion of Russia and the burning of Moscow was well known in Britain (one of the beer tents erected on the ice during the last Frost Fair on the Thames in February 1814, was triumphantly named Moscow) and, when Tsar Alexander I visited later that year, the country went wild about him and he was cheered whenever he appeared. Things Russian became fashionable. Princess Charlotte died tragically in childbirth in 1817, leaving her father, George IV without an heir. There was a rush to the altar as number of her royal uncles hastily discarded their mistresses and made suitable marriages, hoping to produce an heir. The Duke of Kent was the next in line, and his Duchess gave birth to a daughter in 1819, two years after Princess Charlotte’s death. Tsar Alexander I was asked to be her godfather, and she was named Alexandrina Victoria after him and her mother. As a child, she was called Drina but history was to know her as Victoria. Diplomatic gifts exchanged between the Russian and British royal families became more frequent . I rather like the table above but I have to confess that I’m not sure about the elaborately decorated malachite pedestal and vase pictured below, top of the range though it undoubtedly is. 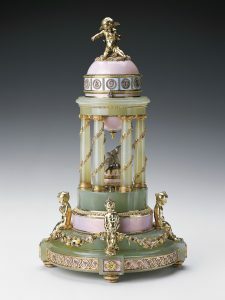 Malachite vase and pedestal given by Tsar Nicholas I to Queen Victoria, 1855. The vase and pedestal is huge, quite dwarfing a tall man who was standing next to it. It was followed by other massive plinths with vases and they certainly made a statement about the esteem Tsar Nicholas held Victoria in. 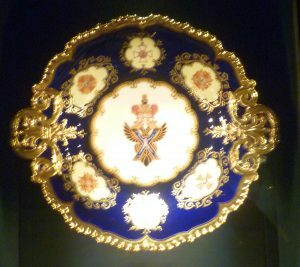 The Queen responded with a magnificent Coalport dinner set in royal blue and gold. Victoria eventually had a large family of nine children and she made it her mission to marry them off suitably; to forge family alliances which would help to preserve peace in Europe and to enhance the prestige of the British crown. 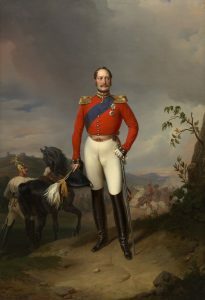 Her eldest son, Albert Edward, was married off young, aged twenty-two, in 1863, which she hoped, would stop him having affairs with unsuitable women and bringing the crown into disrepute. His bride was the lovely but poor Danish Princess, Alexandra. When Alexandra’s sister, Dagmar, made a spectacular marriage in 1866 to Tsar Alexander III of Russia, changing her name to Maria Feodorovna,the ties between Russia and Britain became even closer. In 1874, there was a further dynastic marriage into the Russian royal family. 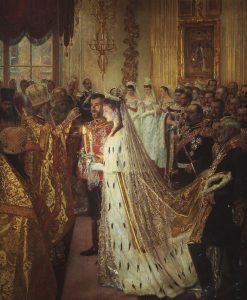 Queen Victoria’s second son, Alfred, Duke of Edinburgh married the Grand Duchess Maria Alexandrovna of Russia, daughter of Tsar Alexander II, in a splendid Russian Orthodox wedding in St Petersburg, followed by an Anglican service. 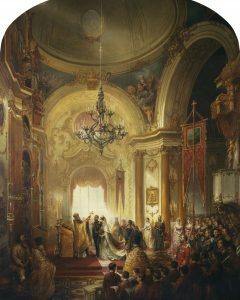 Queen Victoria did not attend but she commissioned Nicholas Chevalier to do a series of sketches featuring the two wedding ceremonies and the various celebrations which followed, finishing with a Bal Polonaise in the Winter Palace. The next generation brought two more British-Russian marriages; Princess Alice, Queen Victoria’s second daughter married Ludwig IV, Grand Duke of Hesse, and two of her daughters, the Princesses Elisabeth and Alix of Hesse, also married into the Russian royal family. Princess Elisabeth married the Grand Duke Sergei in 1884 and, most spectacular of all, Princess Alix, renamed Alexandra Feodorovna, married Tsar Nicholas II. The Russian and British Royal cousins kept in close touch and met frequently. The last meeting of the Tsar Nicholas and his family and the British royal family was in 1909 when the Tsar attended the annual regatta at Cowes on the Isle of Wight and the cousins dined on each other’s yachts. 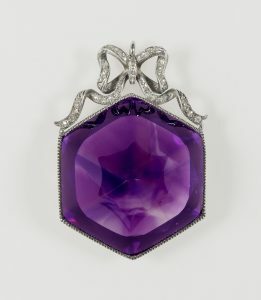 The last two the decades of the 19th century and the first of the 20th were notable for the fabulous gifts from the Fabergé workshops which came into the Royal Collection. The brooch above was given to the Princess of Wales, later Queen Mary in 1909, during what was to be the last Romanov family visit to England. But the two marriages between Queen Victoria’s Hesse granddaughters and the Romanov royal family were to end in tragedy. In 1905, the Socialist Revolutionary Party’s bomb attack killed the Grand Duke Sergei. His wife Elisabeth became a nun and devoted herself to helping Moscow’s poor. But that didn’t save her from being arrested by the Bolsheviks in 1918, and executed. Her sister, the Tsarina Alexandra and her husband, Tsar Nicholas II, and their children were all murdered by the Bolsheviks in 1918. The Tsarina Maria Feodorovna, née Princess Dagmar of Denmark, widow of Tsar Alexander III and sister of Queen Alexandra managed to survive. She was kept under house arrest in Kiev, and, after the war, a British naval warship rescued her and brought her back to England. She eventually returned to Denmark. 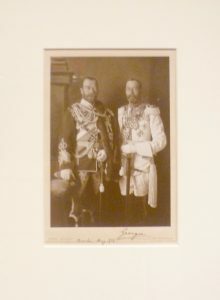 Ernst Sandau’s 1913 photograph of Tsar Nicholas II and his first cousin, King George V. The family likeness is very obvious. The story doesn’t quite end there. After the First World War King George V and Queen Mary set out to make a collection of objects relating to their murdered Romanov relations – perhaps to recall happier times. The Tsarevitch Alexei’s Cossack Dress, 1910, when he was six. 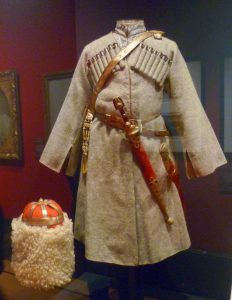 This poignant small boy’s Cossack dress which once belonged to the Tsarevitch Alexei was bought by the humanitarian relief worker, Lady Muriel Paget, who spent much time in Russia during the war years, having founded the Anglo-Russian Hospital with the Tsarina Alexandra to help starving victims of the Russian Revolution. 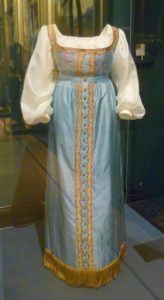 She bought the Cossack costume in 1935 and gave it to King George V. The King might well have remembered the Tsarevitch wearing it. 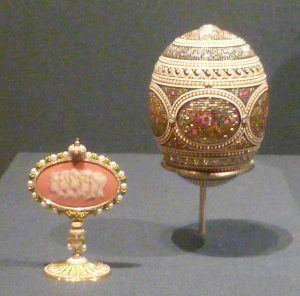 Colonnade Egg, Fabergé, 1910. The four children sitting round the base represent Tsar Nicholas and Tsarina Alexandra’s four daughters. The putto on top, represents their son, Alexei. Russia: Royalty & the Romanovs is a fascinating exhibition which illuminates the complex family relationships between the Russian and British royal families over two hundred years, and demonstrates how the tragedy played out during the Russian Revolution when millions died also deeply affected the House of Windsor. The exhibition Russia: Royalty & the Romanovs is at the Queen’s Gallery until 28 April, 2019. Other photographs by Elizabeth Hawksley. It sounds like an interesting exhibition, Elizabeth. 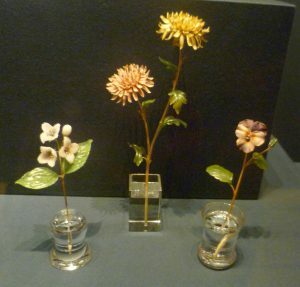 I rather like the Faberge brooch and flowers but I have to say I wouldn’t give those tables or the vase house-room! Thank you for your heart-felt comment, Gail. 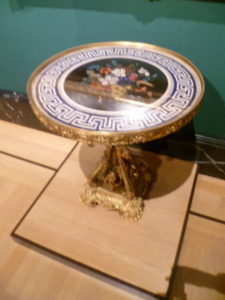 Re: the tables, don’t forget, elaborate decoration was in fashion in the 1870s and there would have been plenty of housemaids to dust and polish them. As for the malachite vases, Queen Victoria owned a number of houses – I’m sure there was a corridor somewhere – perhaps at Osborne House – where they could have been put out of the way. But, who knows, she may have loved them. What a fabulous collection, and the story surrounding the artefacts is both romantic and tragic. I can see a wonderful novel about Dagmar, of whom I have never heard, especially as she survived the Bolshevik revolution. Personally I love malachite, so that huge pedestal does it for me! I perceive I am in the minority here, but hey, each to his own. I’m glad you enjoyed the post, Elizabeth. I love malachite for its drama. I made myself a long necklace of malachite beads alternating with small pearls which I can wear as a long necklace, 1920s style; twist into a double necklace; or even wear it as a treble choker, with earrings to match, which I am very fond of.